Free Shipping Included! 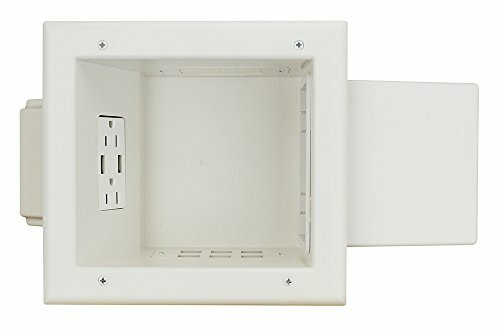 Save 1% on the Datacomm Electronics 45-0251-WH In-Wall, Recessed Expandable Media Box with 4.0 Dual USB Ports, White by Datacomm Electronics at WR Cracine. MPN: 45-0251-WH. Hurry! Limited time offer. Offer valid only while supplies last. Datacomm Electronics' expandable media box with USB receptacle offers you the convenience of power/cable management and storage in one great product. Datacomm Electronics' expandable media box with USB receptacle offers you the convenience of power/cable management and storage in one great product. The 15 amp/125 volt duplex power receptacle gives you power for your display and larger equipment while the dual 4.0 amp USB ports allow you to power smaller streaming devices such as Amazon fire TV stick. The expandable snap-in portion increases in-wall storage by 75% giving you enough room to store larger streaming devices like Amazon fire TV. If you have any questions about this product by Datacomm Electronics, contact us by completing and submitting the form below. If you are looking for a specif part number, please include it with your message.